Lackawanna County is a county in the U.S. state of Pennsylvania. As of the 2010 census, the population was 214,437. Its county seat and largest city is Scranton. The county was created on August 13, 1878, following decades of trying to gain its independence from Luzerne County. (The courts were organized in October 1878.) 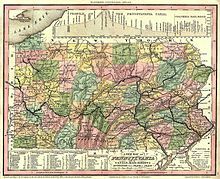 It is Pennsylvania's last county to be created. It is named for the Lackawanna River. Lackawanna County is included in the Scranton–Wilkes-Barre–Hazleton, PA Metropolitan Statistical Area ("Wyoming Valley"). It is the second-largest county within the metropolitan area. It lies northwest of the Pocono Mountains. Lackawanna County is located approximately 40 miles from the New Jersey border in Montague, New Jersey, and also located approximately 33 miles from upstate New York in Windsor, New York. A map of Pennsylvania counties in 1836. At the time, Lackawanna County was still part of Luzerne County. Lackawanna County is a region that was developed for iron production and anthracite coal mining in the nineteenth century, with its peak of coal production reached in the mid-20th century. Scranton, then still part of Luzerne County, became a center of mining and industry. It was the site of the Lackawanna Iron and Coal Company, which later began to produce steel using the Bessemer process. In 1877 at the time of the Scranton General Strike, the company was managed by William Walker Scranton, whose father had been president until his death in 1872. Two of his cousins had been founders of the company and the city. According to the U.S. Census Bureau, the county has a total area of 465 square miles (1,200 km2), of which 459 square miles (1,190 km2) is land and 5.8 square miles (15 km2) (1.3%) is water. As of the 2010 census, there were 214,437 people residing in the county. 92.0% were White, 2.5% Black or African American, 1.7% Asian, 0.2% Native American, 2.0% of some other race and 1.5% of two or more races. 5.0% were Hispanic or Latino (of any race). 20.1% identified as of Italian, 19.9% Irish, 13.0% Polish and 11.4% German ancestry. As of the census of 2000, there were 213,295 people, 86,218 households, and 55,783 families residing in the county. The population density was 465 people per square mile (180/km²). There were 95,362 housing units at an average density of 208 per square mile (80/km²). The racial makeup of the county was 96.65% White, 1.31% Black or African American, 0.09% Native American, 0.75% Asian, 0.01% Pacific Islander, 0.53% from other races, and 0.66% from two or more races. 1.39% of the population were Hispanic or Latino of any race. 22.5% were of Italian, 21.2% Irish, 15.4% Polish and 10.2% German ancestry. There were 86,218 households out of which 27.2% had children under the age of 18 living with them, 48.9% were married couples living together, 11.8% had a female householder with no husband present, and 35.3% were non-families; 31.3% of all households were made up of individuals and 15.7% had someone living alone who was 65 years of age or older. The average household size was 2.38 and the average family size was 3.00. In the county, 21.8% of the population was under the age of 18, 8.9% from 18 to 24, 26.4% from 25 to 44, 23.5% from 45 to 64, and 19.5% who were 65 years of age or older. The median age was 40 years. For every 100 females, there were 89.30 males. For every 100 females age 18 and over, there were 85.4 males. According to research by The Center for Rural Pennsylvania, which is a legislative agency of the Pennsylvania General Assembly, the poverty rate for County was 15.4% in 2014. The statewide poverty rate was 13.6% in 2014. The 2012 childhood poverty rate by school district was: Abington Heights School District - 15.5% living at 185% or below than the Federal Poverty Level; Carbondale Area School District - 64.7%; Dunmore School District - 33.8%; Lakeland School District - 29.2%; Mid Valley School District - 49.2%; North Pocono School District - 31.3%; Old Forge School District - 41.7%; Riverside School District - 43.4%; Scranton School District - 63.7%; and Valley View School District - 29.4%. According to the Pennsylvania Department of Health, Lackawanna County's live birth rate was 2,664 births in 1990. The county's live birth rate in 2000 was 2,148 births, while in 2011 it had declined to 2,200 babies. Over the past 50 years (1960 to 2010), rural Pennsylvania saw a steady decline in both the number and proportion of residents under 18 years old. In 1960, 1.06 million rural residents, or 35 percent of the rural population, were children. As of November 2010, there are 146,383 registered voters in Lackawanna County. The Democratic Party has been historically dominant in county-level politics since the rise of new immigrant populations and their descendants since the mid-19th century. Most of the county is part of Pennsylvania's 17th congressional district. Some of the more rural portions are part of Pennsylvania's 10th congressional district. On the state and national levels, Lackawanna County has strongly favored the Democratic Party for the last ninety years. While it leaned Republican from 1896 to 1924, only failing to back William Howard Taft during that in timespan when the party's vote was split between him and former president Theodore Roosevelt. The county has only primarily voted for the Republican candidate three times since 1928: in the national Republican landslides of 1956, 1972, and 1984. In 2000 Democrat Al Gore won 60% of the vote and Republican George W. Bush won 36%. In 2004 Democrat John Kerry received 56% of the vote and Bush received 42%. In 2006, Democrats Governor Ed Rendell and Senator Bob Casey, Jr., won 70% and 73% of the vote in Lackawanna County, respectively. In 2008 three of four Democrats running statewide carried the county, with Barack Obama receiving 63% of the county vote to 37% for John McCain. In 2016 the county swung dramatically and unexpectedly against the Democrats, with Hillary Clinton becoming the first Democrat to receive less than 50% of the vote in the county since her husband Bill Clinton in 1992, though that result was significantly affected by a strong showing by Reform Party candidate Ross Perot. Donald Trump comparatively outperformed George H.W. Bush's showing in 1992 by slightly over eleven percent as he became the first Republican to carry Pennsylvania nationally since Bush in 1988. Act 13 of 2012, which levied a Marcellus Shale Impact Fee, was signed into law by Governor Tom Corbett on February 14, 2012. The bill provides for the imposition of an unconventional well fee by county (or alternatively municipalities compelling the imposition of an unconventional well fee). A county may impose the fee if unconventional gas wells are located within its borders and it passes an ordinance within 60 days of the effective date of Act 13. A county that did not pass an ordinance imposing a fee is prohibited from receiving funds. This prohibition remains in effect until a county passes an ordinance imposing a fee. In 2014, Lacakawanna County received an impact fee disbursement of $205,082.23 even though there are no wells in the County. The top county recipient was Washington County which received $6,512,570.65 in 2014. Northeastern Educational Intermediate Unit #19 (NEIU19) provides a wide variety of specialized services to public and private schools. It serves the school communities of Lackawanna County, Wayne County, and Susquehanna County. NEIU19 is governed by a board of appointed officials one from the elected school board of each member public school district. Among the serves are: professional development programs for school employees, background/criminal screening of public school employment applicants, technology support to the schools, and special education services. The Intermediate Unit coordinates and supervises the Special Education transportation. The county is also served by the Diocese of Scranton. The Diocese of Scranton operates four regional systems of diocesan schools, which were established after the area received hundreds of thousands of Catholic immigrants. The Holy Cross School System serves Lackawanna County, and is currently composed of seven elementary centers and one secondary center. The Holy Cross System is the second-largest of the four systems, and Holy Cross High School is the only diocesan high school operating a capacity. The Holy Cross System is the result of diocese-wide consolidations made in 2007 in response to decades of declining enrollment as population declined in the area. As recently as 2000, Lackawanna County was home to four Catholic high schools and nearly fifteen elementary schools. While the current configuration of sites and schools educates a fraction of the students once enrolled in Catholic schools in Lackawanna County, vast improvements have been made to the curriculum. Millions of dollars of capital gains have been invested in the buildings and technologies of the schools. As part of the ongoing effort to stabilize enrollment and offer a sustainable school system which is "spiritually sound and academically excellent", the Holy Cross System is embarking on a more aggressive advertising campaign to promote Catholic education and establish stronger and more diverse programs at the elementary level. Sacred Heart Elementary in Carbondale and Marian Catholic Elementary in Scranton were closed in 2011 and were incorporated into LaSalle Academy and All Saint's Academy, respectively. This cut the costs of sustaining two faculties and buildings which collectively operated at less than 50% capacity. It bolstered the enrollments of the hubs of elementary education. Map of Lackawanna County with municipalities and CDPs labeled. The population ranking of the following table is based on the 2010 census of Lackawanna County. ^ a b c David Craft (1891). History of Scranton, Penn: With Full Outline of the Natural Advantages, Accounts of the Indian Tribes, Early Settlements, Connecticut's Claim to the Wyoming Valley, the Trenton Decree, Down to the Present Time. H. W. Crew. pp. 18–. Retrieved March 19, 2013. ^ "Population and Housing Unit Estimates". Retrieved October 11, 2018. ^ "U.S. Decennial Census". United States Census Bureau. Retrieved March 8, 2015. ^ ""American FactFinder"". Factfinder2.census.gov. Retrieved 2018-04-03. ^ US Census Bureau (2015). "Poverty Rates by County Small Area Income and Poverty Estimates". ^ Pennsylvania Budget and Policy Center (2012). "Student Poverty Concentration 2012". ^ "Commonwealth of PA – Elections Information". Archived from the original on 2008-11-27. Retrieved 2009-03-10. ^ "Commonwealth of PA – Elections Information". Archived from the original on 2008-05-29. Retrieved 2009-03-10. ^ "Commonwealth of PA – Elections Information". Archived from the original on 2009-02-21. Retrieved 2009-03-10. ^ Pennsylvania House of Representatives (February 8, 2012). "HB1950 of Session 2011 OIL AND GAS (58 PA.C.S.) - OMNIBUS AMENDMENTS". ^ Pennsylvania General Assembly, Act 13 of 2012, February 14, 2012. ^ Pennsylvania Utility Commission (2012). "Act 13 (Impact Fee)". ^ Pennsylvania Utility Commission (2015). "Disbursements and Impact Fees 2014". ^ Pennsylvania Utility Commission (2013). "Lackawanna County Total distribution for year 2013". ^ PDE. "Education Names & Addresses". ^ "GNIS Account Login". geonames.usgs.gov. Aileen Sallom Freeman and Jack McDonough, Lackawanna County: An Illustrated History. Montgomery, AL: Community Communications, 2000. Thomas F. Murphy, Jubilee History: Commemorative of the Fiftieth Anniversary of the Creation of Lackawanna County, Pennsylvania: Story of Interesting Events from Indian Occupancy of Valley, Connecticut Settlement, Organization of Luzerne County, Start of Anthracite Industry, and Forty Years Effort to Establish Lackawanna County Topeka, KS: Historical Publishing Co., 1928. Portrait and Biographical Record of Lackawanna County, Pennsylvania. New York: Chapman Publishing Co., 1897. Wikimedia Commons has media related to Lackawanna County, Pennsylvania. This page was last edited on 18 April 2019, at 12:21 (UTC).